It's no secret that wearable technology like the smart watches and Google Glass ate the new it thing, and rumor mills have gone agog of potential products from Apple and Samsung are in the works. And Samsung has beaten Apple to the market as pictures of the Galaxy Gear have hit the internet courtesy of Venture Beat. The Samsung Galaxy Gear is said to have a 3.0 inch display which is considerable large (considering that most pre-2013 BlackBerry smartphones and feature phones have a 2.4 to 2.8 screen and even the iPhone 4S has a 3.5 inch screen, so we might as well take this with a generous pinch of salt). The Galaxy Gear is also said to have a 4 megapixel camera, blueetooth and WiFi capability. 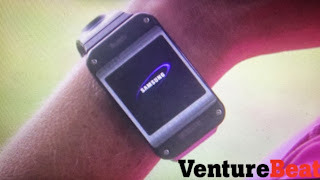 It is however unknown if the Galaxy Gear can serve as a standalone mobile phone just like smart watches of days before Android. The Galaxy Gear is said to have a battery life of about 10 hours which is some what ridiculous considering that it is supposed yo be a watch too. It comes preloaded with the S-Health app making it a competitor to Nike's Fuel band. Beside Samsung and other small OEM, Sony has its own take of the smart watch in the market already.